After being on the road, so to speak, for the past month on a constant conveyor belt of airplane and hotel meals I was in need to something healthy to kick start my solo dining in Paris. I toyed with the idea of dusting down my juicer and then I thought better of it – the juicing part is fine it’s the washing up that makes me question why something so healthy generates so much mess. 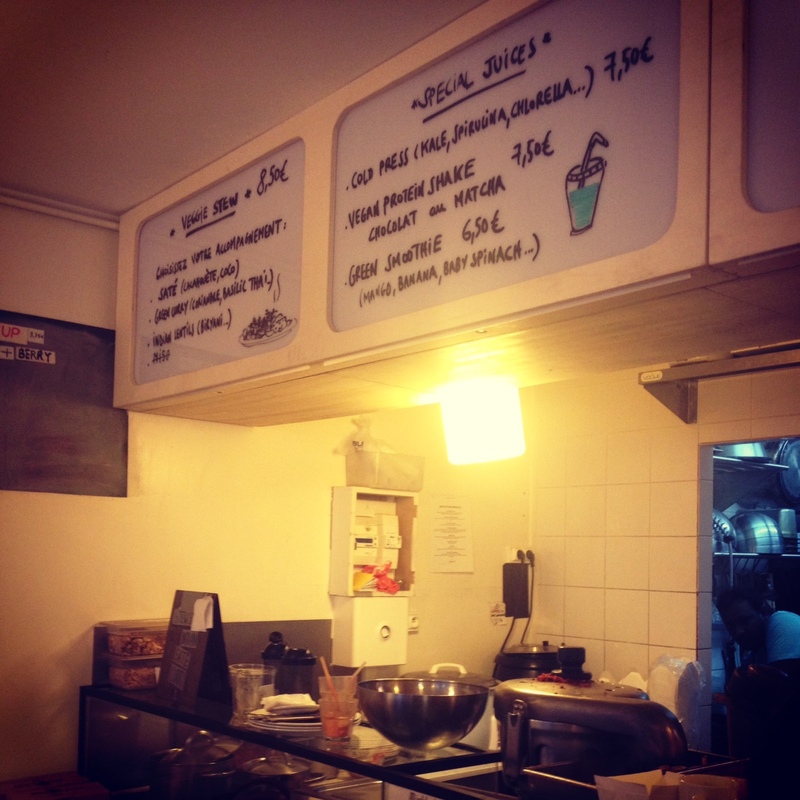 After a bit of swiping on the Ipad I knew the hidden gem that had just what I was looking for Bob’s Kitchen, Paris. 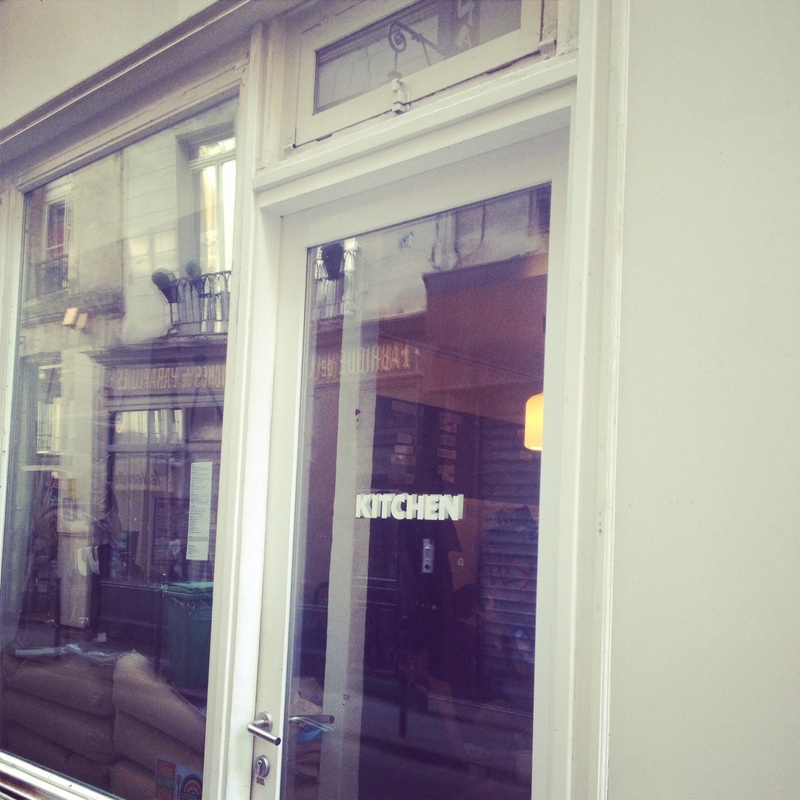 Bob not only has the kitchen which I visited but also a juice bar in the 11th arrondissement and now a bake shop up in the 18th. Bob has his finger in many pies – ha ha! Anyway back to the Kitchen in the 3rd which is tucked down an unassuming street and if you didn’t know the number – it’s 74 – then you could easily walk past it. All it has is Kitchen written on the door, Bob it appears is discreet as well as being multi faceted. I am all for stripping things to the bare bones, keeping it clean and minimal but help a girl out here Bob and just put your name on the window or a chalkboard in the street. As it was I had to look at the menu – if you look closely at the picture below you’ll see a strip of paper stuck to the window. That’s how I knew I was in the right place! Bob’s Kitchen is small containing three long tables and it is all about communal eating, I guess in keeping with the ethos. I sound as if I am Bob bashing. I’m not and in actual fact in my early 20s I worked as a waitress at the original vegetarian restaurant Cranks in London famous for the carrot cake, homity pie etc. 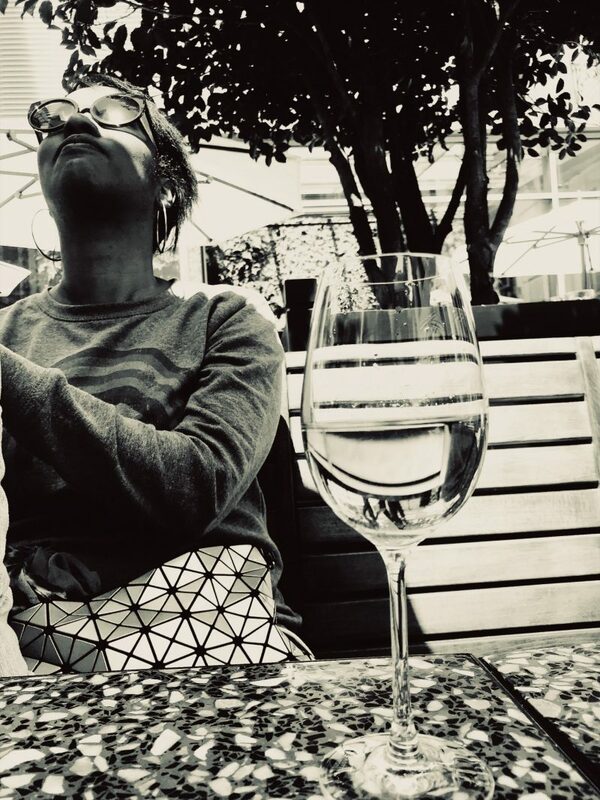 The only problem with Bob’s Kitchen is there is not a lot of room to manoeuvre as you walk in you literally trip up on the people seated at the tables, it’s hot and there is a long queue or at least that was the case yesterday when I got there at 14h30. I felt as if I was in pre-perestroika Russia as I just stood behind the last person in the queue and hoped that at some point I would get served. Personally I was glad I decided to take away as I felt slightly closed in and it was hot – the ventilation is not great in there at all. I had come for a cold pressed green juice full of goodness including kale, spinach, shoots and powders I know not how to spell. I was expecting the juice to be made before my eyes but I was told there were bottles in the fridge and to take one of those. 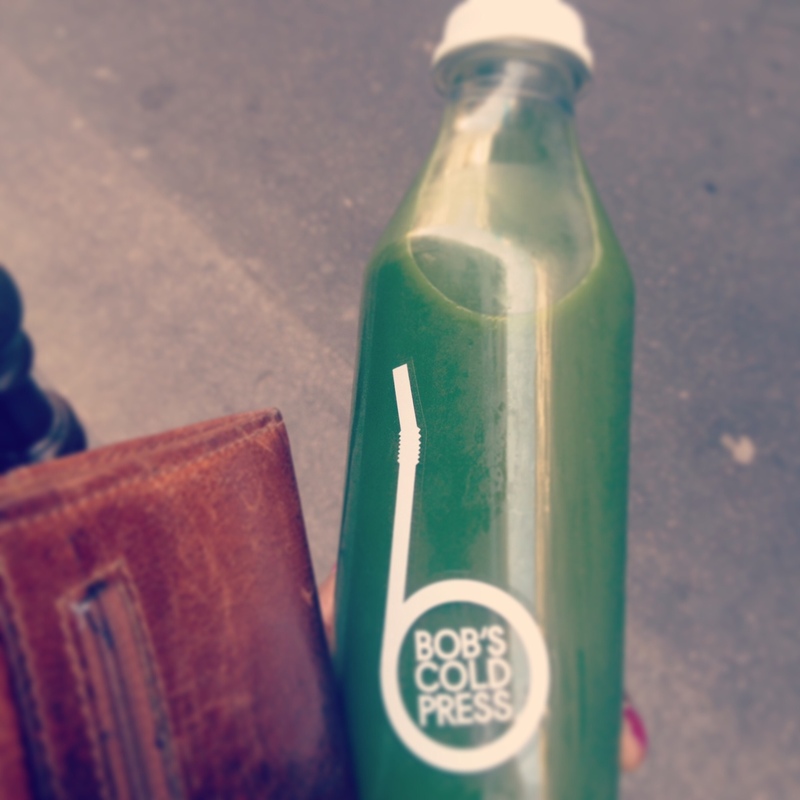 The bottles contained freshly pressed juice just not freshly pressed before my eyes. A small point, I know, but I was actually looking forward to watching them make the juice – that was after all the reason I left my bijou palais took two metro trains to come to Bob’s Kitchen! As I was standing in the queue, which was slow moving, I saw some of the dishes that other customers were eating and they did look delicious especially the veggie stew. Anyway this is definitely the place to come if you have vegetarian friends or are yourself vegetarian or like me just looked to replenish your levels of goodness! How? Line 11 (Arts & Metiers) and if like me you’re ‘GPS challenged‘ even with an iphone just take the exit marked Rue Beaubourg and it’s the 2nd street on the left. I eat here every week, and my gluten/caseine-free eating daughter loves it, especially on weekends with their great pancakes. It’s good to get there by 12 for more room! They were freshly juicing at the beginning of April!